Lower Manhattan is going green more than ever before-- green vegetables, that is. There are now eight farmers markets in the square mike below Chambers Street, including the recently opened Andaz Wall Street Farmers Market-- the first run by a hotel in New York City--and the World Financial Center Greenmarket in Battery Park Park City. 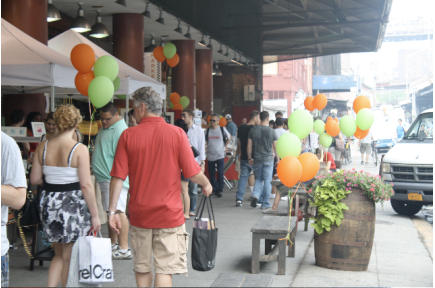 Above, Shoppers enjoy Fulton Stall Market at South Street Seaport.